The Full Time Fabulous post for this month is all about Spring and Summer trends. Not too long ago I wrote a post about color blocking so I definitely had to do an outfit post all about that, as it's been one of my favorite trends this season. I've had this orange Asos top for a bit now and I love the way it flows. I've been really into loose fitting tops recently. A few weeks ago I bought these Southpole stretch jeggings in jade. I chose color blocking as my 2011 trend because I'm one of those girls who really loves to wear blues, blacks and grays. So color blocking gives me the opportunity to truly enhance my style with a chance to wear colors I wouldn't necessarily wear. By the way, I took these outside of Phoenix ComiCon! What do you think of my color blocking look? 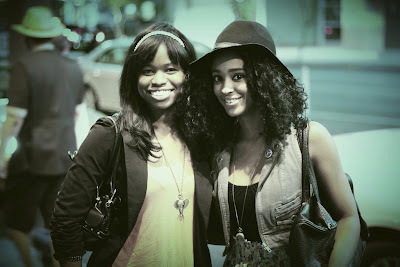 Also I had a blogger meetup with Ria Michelle over the Memorial Day weekend. I like your colour blocking top/trousers. i am loving your cute hair! and cute outfit of course. 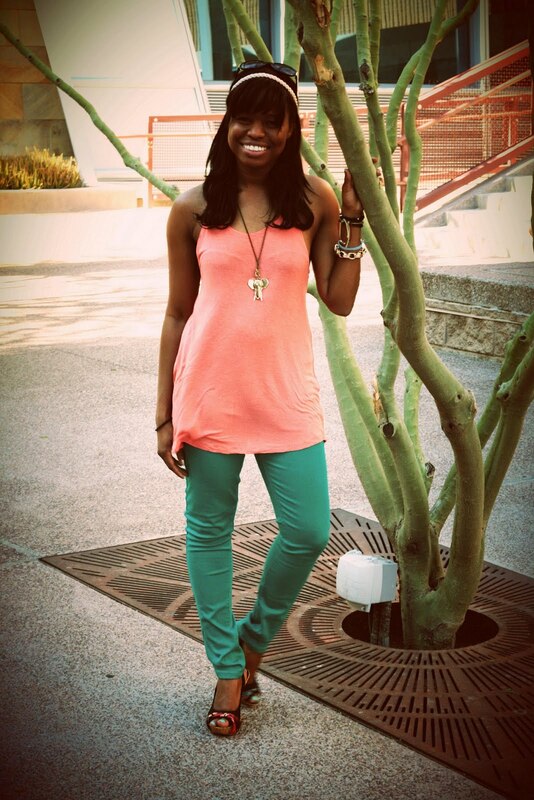 I love this color combo on you - those pants are fab! An absolutely adorable outfit. Love the colors, the accessories. Basically I love the entire outfit. You definitely know how to colorblock. Glad you got to meetup with another fabulous fashionista! Ria-Michelle is truly talented. I love how your wedges go perfectly with your outfit. Love the colors! You look amazing in your color-blocked look! Wish I looked as fab when I'm trying to color block! I have to say, I think color block is THEE blockbuster trend of spring 2011. Seemingly coming from out of nowhere, this ode to bright bold colors appeals to all types and all ages. There is so much happiness in the play of colors, maybe that why it feels so right, right about now- we surely could use a bit more smiling and happiness at the moment. Gorgeous color combo! I love the color blocking trend, it's so fun and you can be even more creative! I love it! Wish I had more brightly colored things to do this trend. Love your pics :) I had a blogger meetup this past week too! Very exciting. I love green, I love orange, so.. why not together? ;) hehehe. The top is so cute, I love loose fitting tops too. You ar totally working this trend. I have also been in to loose flowing tops! :) We are definitely sharing some color today! Love the colors, Cheryl! You look absolutely fabulous! Those wedges and accessories are gorgeous as well! I almost did color blocking for my FTF post, but decided to go with the maxi dress/skirt trend instead. Love those pants. THey are the perfect color. THanks for your sweet comment on my blog! Way to rock the colorblock, girly! You look amazing, and I'm totally crushing on your jeggings. Great outfit! I like your interpretation of color blocking and love those wedges! you chose so great colours! !love this outfit!! Too adorable, and I'm loving the pic with you & the other blogger at your meetup! I love your "leggings" I totally thought they were jeans actually... beautiful colour! Those wedges are perfect with the pants! I love the colour combination and you look stunning! This is color perfection. You look incredible in that tank color!!!! I love your shoes, they are adorable! How fun that you got to meet up with Ria! She actually lives close to me, and I've never met her. I love the color of your top, especially paired with that kelly green pant. The shoes are an adorable way to tie the look together and I love the print on those. Also, the necklace is a great touch! I love this outfit. You have such a gift for putting outfits together. I just can't get over it. I seriously bow to your fashion greatness. The colors are amazing. Your smile is so gorgeous. I'm definitely loving colorblocking as well! You depicted it perfectly! Great color combo. I've attempted the trend but I need to put an outfit together that will stand out. Love your take on color blocking and those super cute wedges! Great post... great color blocking... amazing shoes!! u have great colour blocking skills. perfect styling for a perfect spring look. your outfits are only getting better and better. these are fantastic colors to mix! I love your ftf post! I love so many trends this season, that it was hard for me to finally decide on one! i sooo tried on some green pants yesterday,i should have gotten them! Love the combination with those shoes and pants!! :D nice honey! U look stunning! love the look, and your shoes are gorgeous! Oh Cheryl...I LOVE YOUR DIMPLES!! LOVE THEM. I do like that so many people are taking on brights and I would've never guessed you were a gray and black dressin' gal! colors bring so much fun and joy and surprise in outfits! P.s I can NOT believe your shoes are charlotte russe..are they comfy? If you're going to color block, this is the way to do it. Looking cute and casually chic Cheryl! Lovely! I wouldn't have matched these colors but they look so great together. I love all the colours! and your shoes are so adorable! totally inspiring and your wedges looks so great!!! Color blocking is a nice trend for the summer. I like the fact that you didn't chose too bright and neon colors, but more pastel ones! Love the wedges and the nail color too!